Affordable clean is certified to take care of all your hard surface flooring needs. We use high performance effective cleaning solution and high pressure neutralizing rinse with a fully enclosed vacuum system restoring the shine to your stone or tile and grout surfaces using the best in cleaning technology. Our method uses high pressure to wash the surface removing the built up grim that daily cleaning doesn’t remove. There is no over spray so your cabinets, furniture and carpeted areas remain dry and protected. 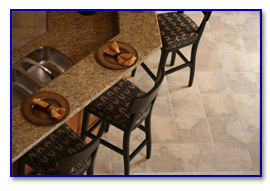 Sealer is always recommended by Affordable clean and your manufactures after the cleaning of any stone, tile and grout. Affordable clean uses only the best high quality sealers giving our clients the best return on their investment. Sealer is the most important step in protecting the integrity of your stone, tile and grout from penetrating stains or discolorations. This makes your daily cleaning easier and keeping your floor looking its best longer.